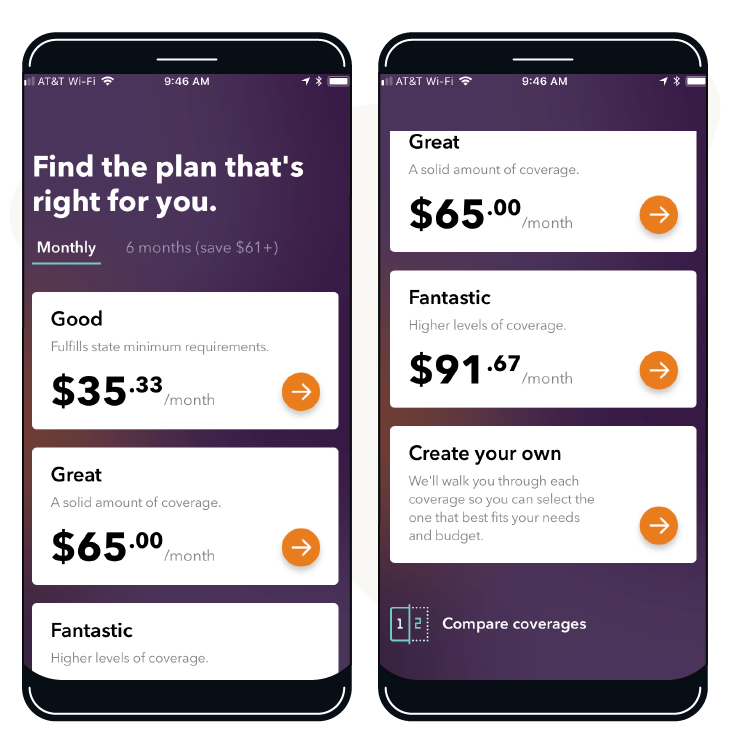 Can a smartphone app be the key to cheaper insurance? There are a lot of factors that go into your car insurance rates, but what if you could zero in on the ones that are important to you, like how good a driver you are? Like most people, I think I’m a pretty good driver. And the numbers back me up on that. The only two tickets I’ve got in years came, by some cosmic coincidence, in the same week back in 2013. And the only “wreck” I’ve been involved in during that time came when someone gently bumped me from behind in a drive-through lane. So why should my car insurance rates be taken from a pool that includes terrible drivers? Where’s the fairness in that? That’s the message that Root Insurance is promoting. They say they price their car insurance based on how you drive. The signup process only took a few minutes. I downloaded the app, then signed up with an email address. You can also sign up with your Facebook or Google accounts. There are a few steps at the beginning that may worry you if you’re super-concerned about privacy. For starters, you have to enable some settings on your phone so that the app can gather information while you drive. The location settings, motion detection, and notifications should be turned on and they run in the background while you drive. 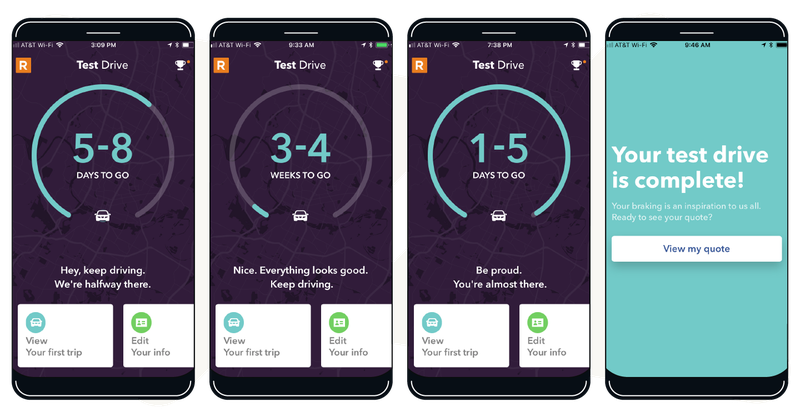 Root is a fast-growing car insurance startup that uses an app to record information about your driving habits—the number of miles you drive, how fast you accelerate or brake, and even what time of day you drive—and provides a quote based on that data. The industry term is "usage-based insurance (UBI)", with the idea that safe drivers who don't put a lot of miles on their car shouldn't pay the same rates as their more reckless colleagues. Like a lot of services today, you give up some personal information in exchange for a lower price. A report from CB Insights shows that participation in UBI is growing. They've tracked more than 10 insurers who have mentioned telematics or their specific telematics programs in corporate earnings calls since the start of 2018, indicating that driving apps are becoming a bigger strategic priority. You also scan in your driver's license (or enter the information manually) so that Root can record your name, address, and vehicle information. After you confirm that info is all correct, you’re ready for the test drive portion to begin. My test drive session said it would last 3-4 weeks, but I had my results in 13 days. I drove mostly around town and to and from work, plus a road trip to Houston. Root kept a countdown screen of the time left on the test drive, as I watched the weeks shrink to days, ending with my notification that it was time to view my quote. What Do We Do When We Know We're Being Watched? Studies have shown that if we think we're being watched, we tend to behave more honestly. One name for this is the Hawthorne Effect, from a set of studies done nearly 100 years ago at the Hawthorne Works factory in Cicero, Illinois. More recently, a group of scientists at England's Newcastle University found that people cleaned up their breakroom more often when a poster showing a face or even a pair of eyes was posted nearby. It may sound creepy, but we are on our best behavior when someone is watching. With smartphone apps like Root tracking our driving habits, companies hope that the feedback we get will turn us into better drivers. Root's "Great" Level quote was almost exactly what I'm currently paying with State Farm. In the end, I decided to stay with my current insurance company because of the benefits of having my car and home insurance bundled together. Once you decide on a coverage level that suits you, there are just a few more taps until you’re done. 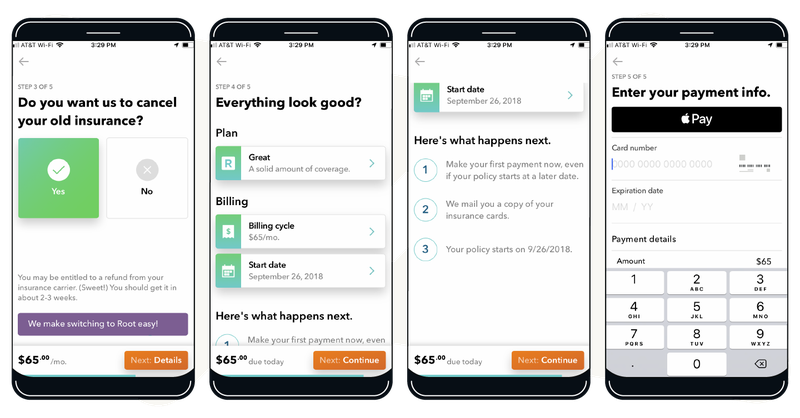 First, you choose a date to begin your policy, which could be as soon as the same day, and decide on a billing cycle: either month-by-month or pay for six months at a time. A lot of people don’t know that you can cancel your coverage at any time, and some companies will refund you any money that you’ve paid for ahead of time. Root offers to handle the awkward breakup conversation for you, contacting your current insurer and letting them know that you’re switching. There’s a final screen to confirm all the details, then you’re ready to make your payment and get your new insurance cards mailed to you. Root makes things easy to pay by credit card or even Apple Pay. Don't worry about letting the app handle things. Each step is simple to understand and runs completely in the background. If you're a good driver who doesn't put a lot of miles on their car, Root could be an attractive option for you. It may seem like an obvious point, but you need to have your phone with you while you drive.